No one wants to start the day with a boring breakfast. Personally I like items that wake up your taste buds and get the day going. The new Honey Bunches of Oats Tropical Blends does just that. This cereal takes the classic Honey Bunches of Oats that you love and adds some pizzazz. With crispy mango flavored flakes combined with real coconut shavings and coconut granola clusters, this cereal has tons of flavor. With all this goodness, you don't have to worry about derailing your diet. This blend offers 10g Whole Grain, 120 calories, and only 6g of sugar. Plus, each serving has 9 essential vitamins & minerals, 4 wholesome grains, and is heart healthy. My kids really like this cereal in the morning because it has a sweetness that they crave. I like it because it isn't full of sugar. All this talk of tropical flavor makes me want to visit the tropical. 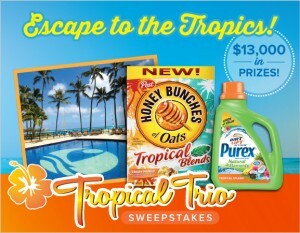 That's where the Tropical Trio sweepstakes comes into play. One lucky winner will be sent to a tropical paradise vacation to Outrigger Waikiki on the Beach courtesy of Purex Brand, Honey Bunches of Oats and Outrigger Hotels and Resorts. Now when you start your morning with a taste of the tropics you could win a trip to the tropics. Use the Rafflecopter below to win some Honey Oats Tropical Blends to start your morning. Disclosure: I received this product to try and to giveaway. All opinions are my own. Just bought one a few days ago and it taste good! I like the one with strawberries. I haven't ever tried Honey Bunches of oats. I like the one with almonds. The one called "just the bunches"! Raisin Medley is my favorite variety. I like the strawberry kind! I like the original Honey Bunches of Oats. I like the Honey Bunches of Oats - Peach and Raspberry Fruit Blends! What's your favorite Honey Bunches of Oat cereal? I like the one with Almonds, which judging by the comments here seems to be the most popular! This Tropical Blends flavor sounds intriguing. I like the original flavor! I HAVE NEVER TRIED IT BEFORE!! I like the the kind with almonds. I like the Fruit Blends. so far i like the regular blend, but i'll try any!